Watch happily as your baby devours this tasty and filling combination ofPears, Pumpkin, Banana & Coconut. Love Child Organics’ range of tasty and nutritious Super Blends are perfect both as a meal for babies and as a snack for young children. 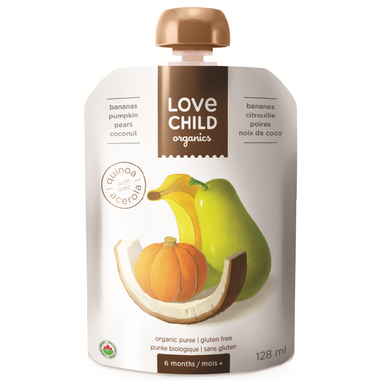 Love Child starts with a delicious blend of organic fruit and vegetable purees (with no ascorbic or citric acid), and then add quinoa and acerola fruit, which are both nutrient-rich and also gentle on little tummies. Quinoa is an ancient seed, more commonly identified as a grain, that provides complete protein, and acerola fruit is an amazing natural source of Vitamin C (over 30 times as much as oranges!). You can be confident that with each tasty mouthful, your little one is getting as much natural goodness as possible. My 5 year old problem eater loves puree! Great combination of flavours, my baby loves it. Wish it was a little thicker though.